We conducted some research recently and were surprised to find that nearly a third of people in the UK suffer from claustrophobia at some point in their lives. This fear of small spaces seems to be worse for women, affecting 36%, compared to 27% of men. Nearly a quarter thought being trapped in a confined space during childhood was the root cause of their claustrophobia, with a further fifth citing a traumatic or stressful life experience such as a bereavement. Reported symptoms included a general feeling of panic, shortness of breath/hyper-ventilation and sweating/chills. Avoiding situations known to trigger attacks is the most common step taken to help, whilst others rely on breathing techniques or focus on relaxing images. The three worst scenarios for claustrophobia are a tiny room with no windows, crowded places and a ‘tunnel’ MRI scanner. Over half of those who’ve been scanned in an enclosed MRI tube said they felt very nervous. A further 10% required sedation and another 13% asked for the process to be stopped altogether. So, if your consultant refers you for an MRI scan to diagnose a medical condition such as back pain or whiplash, is there any alternative to that cramped, noisy tunnel? The good news is that yes, there is! Here at Medserena we offer Upright, Open MRI scans. You can sit down or stand up with nothing in front of you. Importantly, our machines are far quieter than conventional scanners. You can watch TV on a 50 inch screen, and a friend or relative is welcome to stay with you in the room the entire time. Even the head coils for brain scans allow a clear view of the surrounding area outside the system. With its completely open front, access is more straightforward. Upright Open machines can also accommodate larger patients who would otherwise struggle to fit into a MRI tunnel. Upright scans can often provide a more conclusive diagnosis too. By sitting in a natural weight-bearing position, or moving into different postures, the scan is carried out in exactly the position that pain is felt. Our research found that a quarter of people with claustrophobia said they would prefer to leave a medical condition untreated, if they were very frightened of the test to diagnose it. That’s just not good enough in the 21st Century. 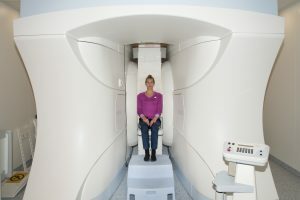 So, make sure you tell your NHS doctor or consultant that you suffer from claustrophobia and that you want to sit upright in an open MRI scanner. They should be able to refer you to the Medserena Upright MRI Centres in London or Manchester. If you’re lucky enough to have health insurance or can self-pay, then insist on it.